Credit cards are the largest source of financing used by small businesses, and their use has grown steadily with the deepening recession, says the National Small Business Association. As of late April this year, 59 percent of small-business owners reported using credit cards to finance their firms, versus 49 percent at the end of 2008, despite worsening credit card terms, according to association surveys. This year, 79 percent of small business owners reported worsening terms, compared to 69 percent five months earlier. A third of small-business owners reported their credit limits had been cut, up from 28 percent in December 2008. More small-business owners, meanwhile, are carrying balances. Only 40 percent- versus 50 percent in December 2008--said they paid off their credit cards every month. Twenty-three percent carry balances of less than $10,000; 21 percent carry balances of $10,000 to $25,000; and 16 percent carry credit card balances of over $25,000. Small businesses were excluded in the credit card reform law signed by President Obama in May, and legislative efforts to expand the protections to small-business owners have yet to bear fruit. Most small businesses reported using business-only credit cards, but more than a third of owners of firms with four or fewer employees reported using personal credit cards to finance their businesses, and 10 percent reported using both business and personal credit cards. So why get a business credit card versus a consumer credit card? Opening a business credit card lets you establish a credit history for your business. In the beginning, your small-business credit card impacts your personal credit report and credit score. But once you've established a solid history of paying your bills on time, you can take steps to separate the account from your personal finances. Whether you get a personal or business credit card for your small business, shop around for the best credit card rates and terms. • Look for low interest credit cards if you plan to carry a balance, and cards with low annual fees and longer grace periods if you plan to pay off your balances every month. 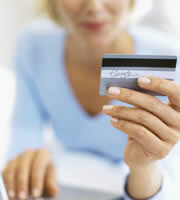 • Compare credit card rewards and study the restrictions. Too many blackout dates could make those airline miles useless for essential business travel. • Check out the grace period. It may be worth it to get a card with a higher annual fee and a longer grace period than one with a low annual fee and shorter grace period. 0 Responses to "Business Credit Card Use Growing Quickly"